Citizens for Responsibility and Ethics in Washington (“CREW”) filed a lawsuit today accusing the Department of Justice (“DOJ”) of failing to properly respond to records requests. Hours later, the DOJ caved in to CREW’s demands. In response to the DOJ’s lagging, CREW filed suit this morning, alleging a violation of the Freedom of Information Act (“FOIA”) at 5 U.S.C. § 552 and seeking an immediate declaratory judgment per the Declaratory Judgment Act, at 28 U.S.C. §§ 2201 and 2202. CREW’s full complaint is available here. In its request for expedition, CREW explained that given the highly unusual, if not unprecedented, action to secretly leak the contents of documents currently under review by DOJ’s inspector general, the public has a clear and pressing interest in learning whether the leak was properly authorized and the extent to which the interests of the texts’ authors were appropriately considered and protected. Apparently someone at Trump’s DOJ got the memo. The lawsuit was filed just this morning. 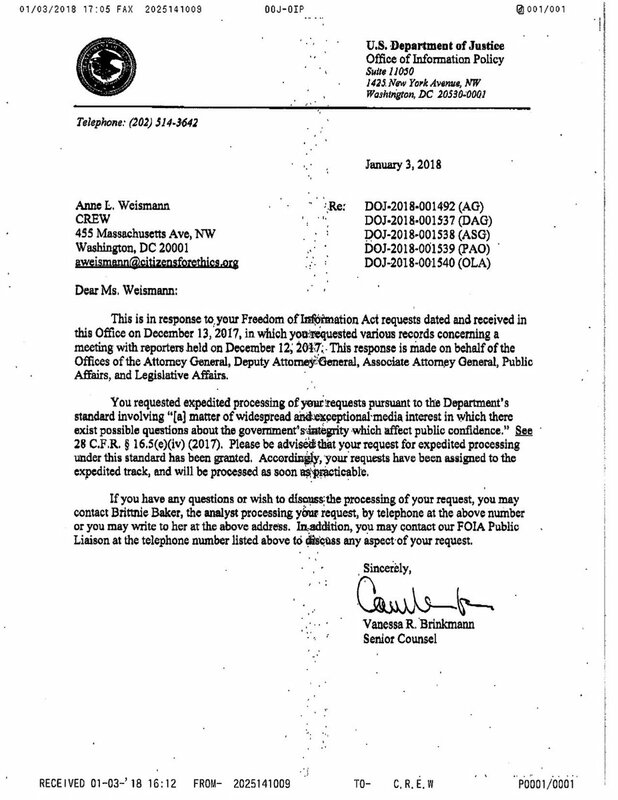 As of 4:12 p.m. today, the DOJ responded and finally provided the documents originally requested on December 13. CREW is a purportedly non-partisan and nonprofit legal group currently run by former Barack Obama administration ethics attorney, Norm Eisen and former George W. Bush administration ethics attorney, Richard Painter.